Looking for the perfect focal point to your landscape design? Or a way to extend the use of your outdoor space? The warm summer days of Northern Virginia won’t last forever, and a new fireplace can add warmth and light to your backyard, allowing for year-round enjoyment. From summertime parties to fall nights roasting marshmallows with the family, it serves as the perfect gathering space for any activity. O’Grady’s Landscape specializes in outdoor fireplace design and installation for homes throughout Great Falls, VA. We can bring the warm glow of a fire to your backyard or incorporate it into a complete patio design to create the perfect space for outdoor entertainment. 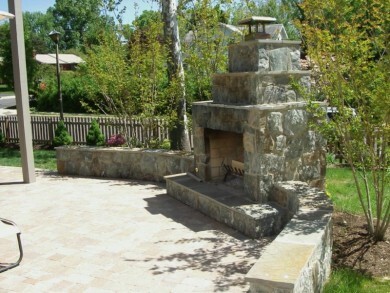 At O’Grady’s Landscape, we can help you design an outdoor fireplace tailored to your exact preferences. Consider the types of materials you want to use, where you want to install the new fireplace, and your primary goal for it—such as whether you want to create a romantic, cozy nook or the perfect place for outdoor parties—before beginning installation. We’ll handle the building and zoning requirements for you so all you have to do is tell us the size, color, and style you want, and we’ll take it from there. Effective outdoor fireplace materials to consider include brick, stone, or block and stucco, with the color and size options dependent on your choice of material. You may also want to think about including your fireplace as the focal point of your patio space or adding an arbor around it to complete the look in style. If you need any help with the selection process, don’t hesitate to ask—our landscape designers have years of experience creating beautiful outdoor fireplaces for all types of properties throughout the Great Falls, VA area! Check out our photo gallery for examples of outdoor fireplaces we’ve installed in previous projects and the gorgeous hardscapes that complement our designs! When you want to renovate your landscape in Great Falls, VA, contact O’Grady’s Landscape. We have years of experience and expertise designing and installing all types of custom hardscapes, including outdoor fireplaces, so you can be confident that the final product will be a result of thoughtful design and careful craftsmanship. We respond to all consultation requests within one business day. Our landscapers and project managers work together to provide the highest level of support possible throughout all stages of the design and build process. Your neighbors all over Great Falls, VA choose O’Grady’s Landscape for all their landscape design needs. Contact us for your outdoor fireplace design and installation project, and see the difference for yourself!